"Wow, Keiichi and a woman? And to top it off, you're living with a foreigner." Animeigo brings us the first in the two disc set of Oh My Goddess!, a five part OVA created between 1993 and 1994, based on Kosuke Fujishima's manga, Aa! Megami-sama, which began publication in 1988. For its original releases in North America, the title was translated as Ah! My Goddess, which appeared on the CDs, LDs and English manga translations, but was apparently changed once the play on "Oh my God" was pointed out to the series' creator, according to the liner notes included with this release. The location of the exclamation point also became an issue, as it deviates from the accepted location in the title. Pioneer, who holds the license for the movie, is releasing their DVD under the Ah! My Goddess banner, which should continue to confuse people. Keiichi Morisato (Masami Kikuchi), a member of the Auto Club, is keeping watch over his college dorm while his roommates are out, when he decides he needs to order something to eat. While looking for someplace that is actually open at that time, he accidentally dials into the goddess helpline of the Relief Goddess Office, and gets a delivery he wasn't expecting: Belldandy (Kikuko Inoue), a real live goddess, complete with flowing robes and the ability to materialize out of his mirror. She is empowered to grant him a single wish, and after thinking about his options, Keiichi decides he wants a girlfriend just like Belldandy, which she misinterprets as a girlfriend who is Belldandy. When the Ultimate Force grants his request, they are bound by contract, and are from that moment forward inseparable, however the dorm rules don't allow women on the premises, so the two of them are cast out onto the streets when Keiichi's mates return. Belldandy suggests they head for an old temple she knows of, where the two of them set up camp. After applying a bit of goddess magic, the place is transformed into their new home, which is a perfectly intimate setting for a budding romance to flourish. However, as Keiichi finally gets the nerve to make a play for Belldandy, his sister Megumi (Yuriko Fuchizaki) shows up suggesting she move in too, with a little incentive from the monetary care package she has brought from home. This puts a bit of an obstacle in the way of the romance, which is something goddess number two's arrival tries to remedy, as Urd (Yumi Tooma), Belldandy's older sister, shows up to encourage Keiichi to turn up the relationship a notch. Finally, abandoned by her two older sisters in the Relief Office, Skuld (Aya Hisakawa), goddess number three, makes a splashy appearance and finds out about the contract, which sets the stage for something to be done about it�in goddess fashion of course. It isn't easy having a goddess for a girlfriend. The concept for Belldandy originated in a four panel gag cartoon featuring cast members from Kosuke Fujishima's first manga, You're Under Arrest, praying to a goddess to win the contest running in Morning Party Extra. The names of the characters in Oh My Goddess are derived from some interesting sources. 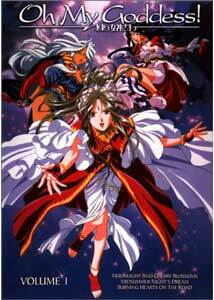 The goddesses, Belldandy (originally Verthandi or Verthande), Urd (optional spelling: Urthr) and Skuld, are based on the Nornes, the goddesses of fate from Nordic mythology. The members of the Auto Club, such as Tamiya, Ootaki, and Aoshima get their names from Japanese plastic model manufacturers. The premise and story of Oh My Goddess! makes it a welcome addition to the anime collection, with its playful style and gorgeous artwork, expanding its cast as the series moves on. and OMG does a wonderful job of advancing the relationship between Keiichi and Belldandy just enough to keep it interesting, while throwing all manner of roadblock and misunderstanding in the way. There are several rivalries set up by the end of this disc that look like they will provide interesting resolutions in later episodes. The voice acting is perfect, the character design is awesome, as are the exquisitely colored settings, which add a tremendous amount to the appeal of the show. With only two more OVAs to go, I know this is going to be one I am wishing for more of when it's all over. Image Transfer Review: Oh My Goddess! is presented in its original 1.33:1 aspect ratio. Colors are vibrant, detail is good and black levels are solid. Unfortunately though, due to the source materials supplied by the Japanese licensor, this title suffers from some pretty distracting vertical rainbowing, which manifests itself on most of the outlines. There is also a fair degree of jagginess on outlines as well, and some minor but noticible compression issues. These effects are going to be most noticible on higher end setups using progressive scan and component connections. Viewing this via S-Video eliminated all the rainbows, but sacrificed sharpness significantly, while inducing a lot of banding in the image, so this is not really an ideal solution. Considering how great the artwork in this series is, this is a major disappointment. As for the grade, everything but the rainbowing looks pretty good on either system, so it isn't fair to trash the image quality too badly. Audio Transfer Review: There are several audio choices here, including the original Japanese stereo track used for this review. The soundstage is well utilized with good directionality. There have been complaints about the mix being too heavy on the music, resulting in dialogue that is too low, which I would concur with, though this is a function of the source recordings. An English dub track and a music and effects-only track are also included, allowing for your own karaoke performance of the show. 1 Feature/Episode commentary by English voice actors Juliet Cesario, Scott Sompson, Pamela Weidner, voice director Scott Houle. Extras Review: An interesting addition is the commentary track by English voice actors Juliet Cesario (Belldandy), Scott Sompson (Keiichi), Pamela Weidner (Skuld) and voice director Scott Houle. This is a group commentary, and sounds quite spontaneous, though beware that the cast is continually dropping spoilers for episodes not included on this disc, so if you haven't seen the entire series you will want to avoid this until later. I would have liked them to introduce who their characters were at the start, and I also question the decision to place the commentary audio only in the right speaker, even though this does allow some of the dub track to be more easily heard. The extras page allows access to the commentary (with or without English subtitles), plus the music and F/X only track, also with or without subtitles. There is also a 02m:17s slideshow presentation with cell and promotional art set to music from the show. The text for the opening and end credits is encoded as subtitles, allowing clean credit sequences on the fly, a feature I like quite a bit. Also, there is a hidden omake featuring a commercial for (I believe ) the AMG Movie in the episode menu, though it is in Japanese. Also, Animeigo includes their standard "recipe" style liner notes, giving background on the names used in the show, plus English/Romanji lyrics to the opening and closing songs. I like these liner notes a lot. Oh My Goddess! is extremely fun and filled with beautiful artwork, which makes anything less than perfection in its presentation more disappointing. Even though I would stress that the faults here lie in the masters, with the amount of effort Animeigo is investing in their Macross restoration, Oh My Goddess! is an unexpected letdown in terms of video quality, especially on better systems, which makes this a tough call for recommendations. I love the series, but suggest those of you with component or progressive scan capability may be disappointed with the presentation. Recommended with that caveat.